When FBI agent Jane Hawk's husband commits suicide, she can't believe he took his own life. She goes 'off grid' to hunt those responsible and discovers a massive surge in similar deaths; people who appeared outwardly stable and rational taking their own lives in unexpected circumstances. What she uncovers is terrifying. It threatens not only her life and that of her son's but also the lives of thousands of innocent Americans. Dean Koontz was one of my go-to authors as a teenager and young adult but then life took over. I've always considered Koontz to be an author who could write some damn fine novels... and some, well, not damn fine novels! The Silent Corner left me pleasantly surprised. It's a cracking story of one woman's determination in the face of adversity. Jane Hawk is a woman of strong mettle - she's determined, loyal, empathetic and sassy. It made for a thrilling and highly enjoyable read. My only criticism would be that it's somewhat wordy and overly descriptive. I'm sure it would work just as well minus a hundred pages or so. That being said, I'll be looking forward to the follow-up, The Whispering Room, released for the kindle on Dec 28th 2017 (with slightly less pages than its predecessor). 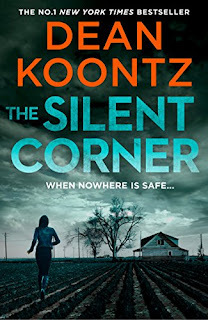 My thanks to Dean Koontz, HarperCollins and NetGalley for providing a copy of this book.